Box Diving for Fun and (No) Profit – Dork Forty! So we had a little funnybook show here in town this past weekend. Nothing spectacular. Just a Masonic Lodge full of comic and toy dealers, and a few local artists shaking hands and drawing pretty pictures. A friendly little con, and a damn fine end to my vacation, where I enjoyed socializing as much as I did box-diving. But I got some of that done, too, and (since my brain is still too vacation-addled to write anything more disciplined) I thought I’d share the loot I snagged. …I wind up with Devil Dinosaur. 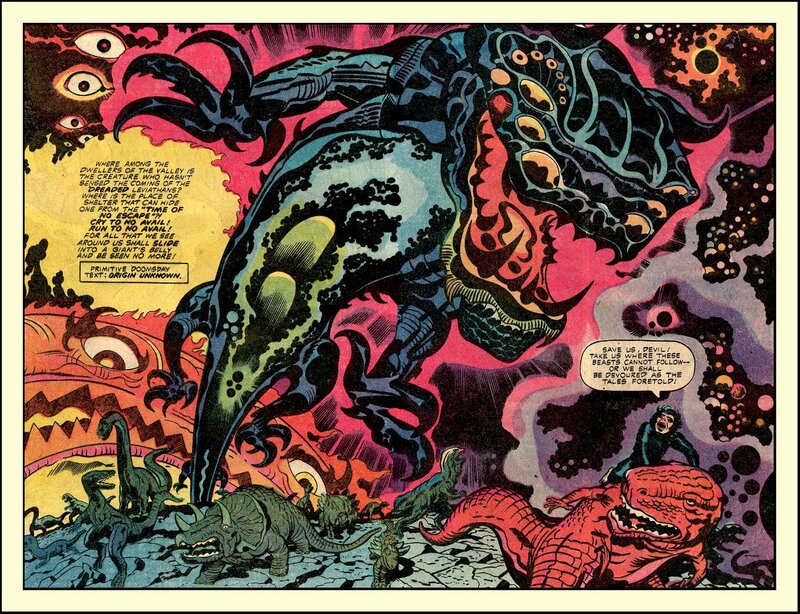 This is one of the few Kirby books of the era I’ve never actually read. But as you can see above, it’s pretty trippy stuff. I enjoyed the issues I picked up this weekend so much, in fact, that I ordered a copy of the trade collection. So there might be a retro review coming up one day soon. In this one, the Carrot punches some dudes, gets drunk, meets Death, picks up chicks, dodges a murder attempt from a disgruntled ex, and buys an inflatable love doll named Melba. Other comics only wish they were this awesome. Heh. Love me some Spandex Frankenstein. 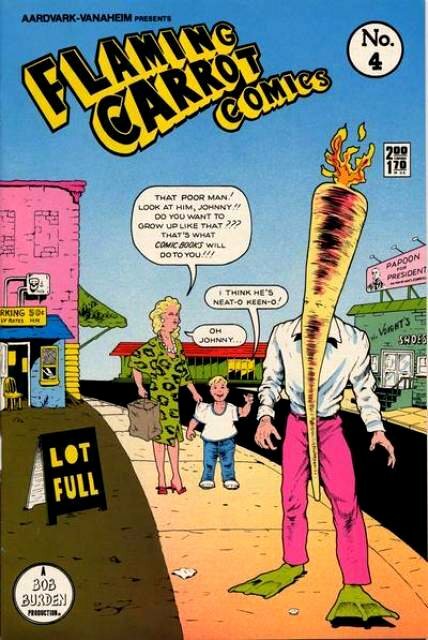 This is one of those legendarily awful comics, right up there with Brother Power the Geek and the collected works of Rob Liefeld. But there’s a charming idiocy to this one that makes me smile. 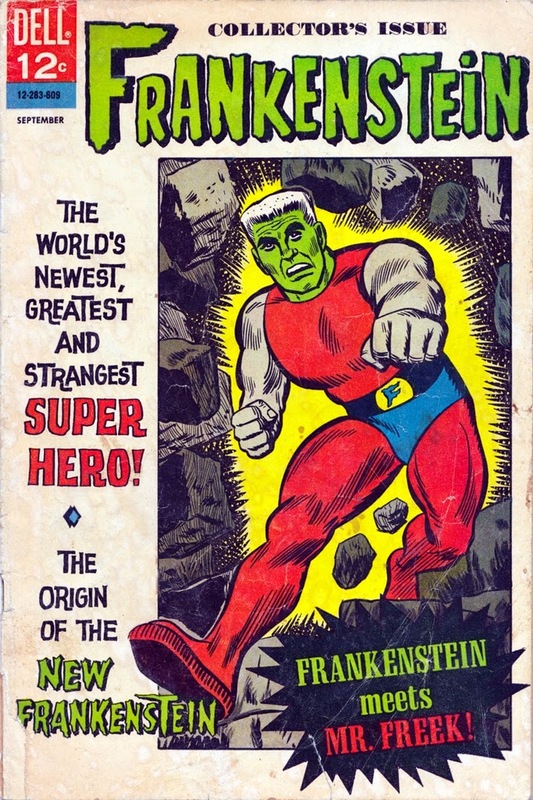 I mean, this is a funnybook in which the Frankenstein monster is awakened by a massive bolt of lightning and decides to fight crime in sleeveless red tights! As the story progresses, Our Hero saves the life of a rich guy (or at least, saves him long enough for the old boy to hand over his millions before his heart gives out from the strain). Then he picks up a girlfriend determined to prove he’s Frankenstein (maybe she just wants to know if anything else on him is green?). And he also fights Mr. Freek, a midget genius who rides around on the back of a monstrously strong gorilla. It’s simultaneously awesome, and absolutely terrible. A welcome addition to my collection, then, well-worth the five bucks I paid for it (and long-time readers know how reticent I am to pay five dollars for any funnybook!). 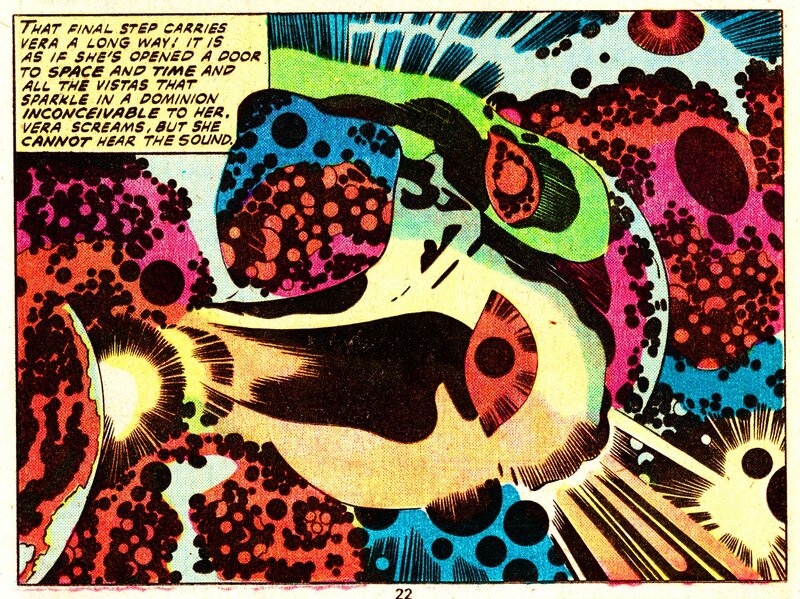 A much-maligned later Kirby work, 2001 is actually one of my favorites. This is, of course, an adaptation of the Stanley Kubrick film, and it would be difficult to think of two storytellers whose aesthetics are more diametrically opposed than Kubrick and Kirby. Whereas Kubrick is all about quiet subtlety and control, Kirby is all restless creativity and non-stop bombast. They’re interested in similar ideas, though. 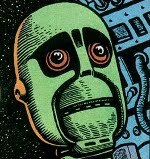 Or at least they were in their respective adaptations of Arthur C. Clarke. 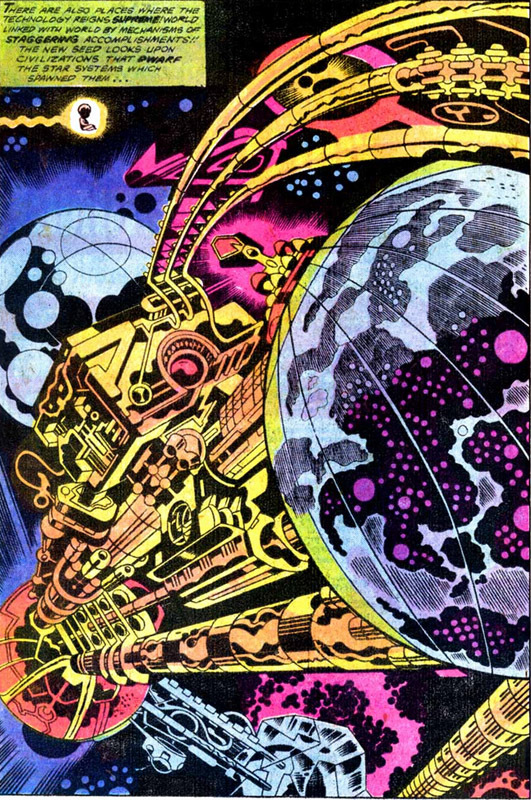 So while Kirby is tonally the most wrong person possible for this book, his fascination with evolution and transcendence, the nature of human advancement over time, makes him the perfect guy to have tackled it. It’s that dichotomy that attracts me to the book. Woo! Trippy! You might notice that not much of that looks like something from the movie. That’s because Kirby knocked out his direct adaptation in a Treasury Edition tabloid, and spent the regular series expanding on the themes. 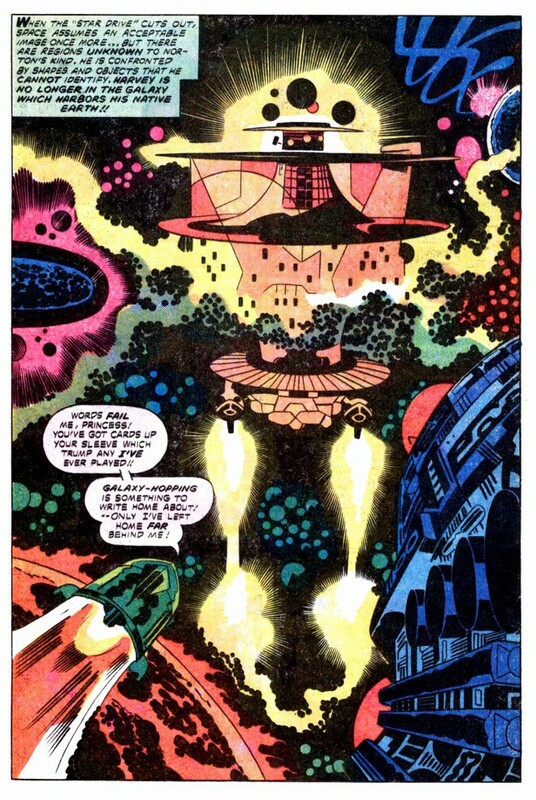 It’s the regular series I’m most interested in, Kirby’s exploration of what it was he thought the movie was about. 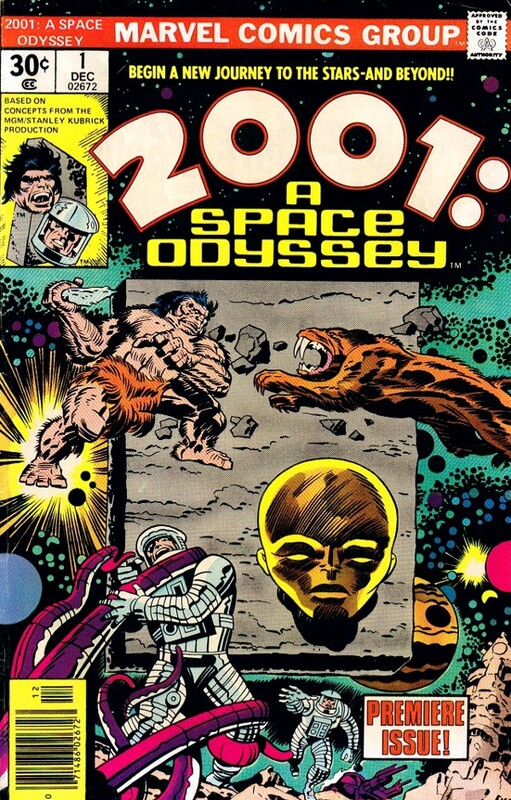 Because of licensing issues, however, it’s doubtful that 2001 will ever be collected. So I’ve been picking these up on the rare occasions I’ve run across them in the wild, with only limited success. But this weekend, I found a nearly complete run at a more than reasonable price. So I pounced. Much like Devil Dinosaur, I can’t wait to dive in. Definitely expect a retro review of this one once I’m done reading. Neal Adams Challengers of the Unknown, anyone? …but that’s the highlights. The con was a good time, and I got some good reads. What more can a dork ask for?